In order to make this post, I made a few Internet searches and found information on the names that appeared on the typewritten lists. Evelyn worked in the 5 b’s (or 5 bobbins area where they ran bobbins of thread on to other bobbins) it was a section for that specific manufacturing process in the mill. From the seniority list paper on the mill wall, she started worked there on February 27, 1942, and through the WWII years until 1957 when the mill shut down overnight. She was a part of "The Greatest Generation." During the early WWII years the silk thread from the mill went into the sewing of parachutes for the war effort, until raw silk from Japan became unavailable. From her obituary in the Cumberland News dated January 3, 1968: Evelyn Steele died January 1, 1968 it appears she never married as there was no mention of children or any mention of a husband, but she came from a large family of brothers and sisters. She worked out her years in a retirement home. She died at age 60 Wednesday, January 1, 1968. Russell Nine was employed at the mill beginning May 25, 1942 through closing in June 1957. Margaret Yantz worked in the mill from April 10, 1946 until it closed in 1957. From her mothers obituary dated January 11, 1943 Cumberland Times her Mother died at age 79 and she Margaret was at home with her sister Bessie at the time of her mothers passing. They were from a a family of seven, five sisters and two brothers. (source roots web)* She was also part of "The Greatest Generation." Elizabeth Leatherman~ was married to John Leatherman.. John came home to Lonaconing on Dec 20, 1942 from Augusta Military Academy, a brief note from a local paper reported. Eva (Nightengale)Watkinson~ Married John Watkinson and had 5 brothers and two sisters. (from her sisters obituary Florence Duckworth, dated Feb 19, 2010 Medville Tribune.) It also appears from her sister's obituary that she too worked at the mill at one point in her life. During the great depression the Mill reorganized and changed the name from the Klotz Throwing Company to the General Textile Mills. An Oral History Doc on the mill can be download from the Internet at this site. Silk Mill and Oral History. The Lonaconing Silk Mill 1907-1957 was written and published to preserve the memories and experiences of the people who lived and worked in the mill. This was the first of many books to be produced by the Allegheny High School Social Studies Department. A calendar from the year the mil closed still hangs on the wall. Virgil Alexander, I found a record of a Virgil Alexander as Mayor of Lonaconing from 1950-1956 and from 1960 -1962. 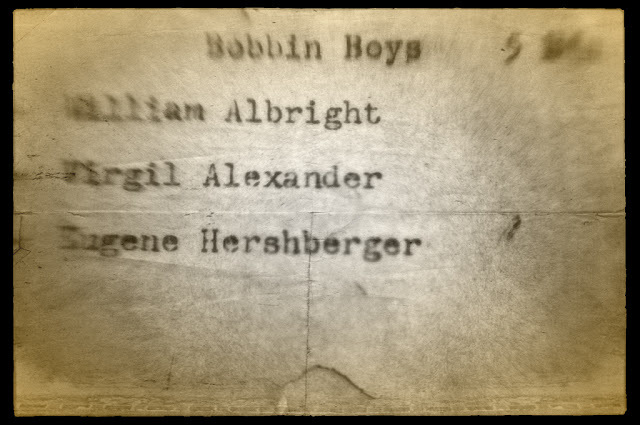 I am going to assume that this may have been the father of the bobbin boy Virgil Alexander or it could have been one in the same, in small towns Mayors came from all walks of life. In a Cumberland Times newspaper article from April 1961, it stated he was a furniture salesman in Cumberland. Great set and very interesting information on the people of the mill. Thanks Nancy for checking out the blog! Very atmospheric images, Karen, and fascinating information about these mill workers. You really are a talented and thorough researcher. I read all this information with deep interest. Thanks you Shaun, glad you felt the atmosphere! I enjoyed the research as well. Maybe in my genes...my folks researched and wrote all the Geneology for both sides of the family, which they left for us to enjoy.